Liquor, Beer, Wine and Food. Also pool tables and wide-screen TV's showing sports. In the shopping plaza at the north-east corner of Wickham and Aurora Roads. 9:00 pm - 1:00 am Crickets gets the Pipe! FunPipe Rock & wings...Join us for some rock & roll & unbelieved earballs..
9:30 PM - 1:30 AM WhichDoctors Rock Crickets WhichDoctors Rocking party music all night long. 9:30pm - 1:30am Spanks plays Cricket (?) Spanks Band Huh? 9:00 pm - 1:00 am Funpipe Friday at Crickets! FunPipe What else gonna do? If you like Hard Rock..then join us for some serious fun! 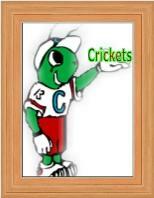 9:30 PM - 1:00 AM Radar Red plays Crickets! Radar Red We Play Rock Dammit! 9:00 pm - 1:00 am Crickets gets the Pipe! FunPipe More Fun..More Rock.. Join us! You may not believe you earballs!